Do you ever wonder how and why rural counties are easy targets for private landfills? The answer is money—perceived easy money. Waste-management companies know most local governments are cash-starved, especially those outside the bright lights of big cities. Elected officials in our kind of towns are often on a first-name basis with the folks who put them in office. County commissioners are always looking for ways to say to the people sitting next to them in church or at civic meetings: “We aren’t going to have to increase your taxes next year.” Usually, that’s sweet music to taxpayers. Addington used that sales pitch in the early 1990s to get our commissioners’ support of a regional landfill in Broadhurst. Commissioner Eddy Lane, may you rest in peace. You voted against the proposed regional landfill. Not only was the county going to get paid money to allow dumping of outside-the-county garbage, but Wayne County was going to send its trash to the landfill for free. “Free” and “easy” money got us to swallow the bait without considering the unintended consequence of threatening our environment. 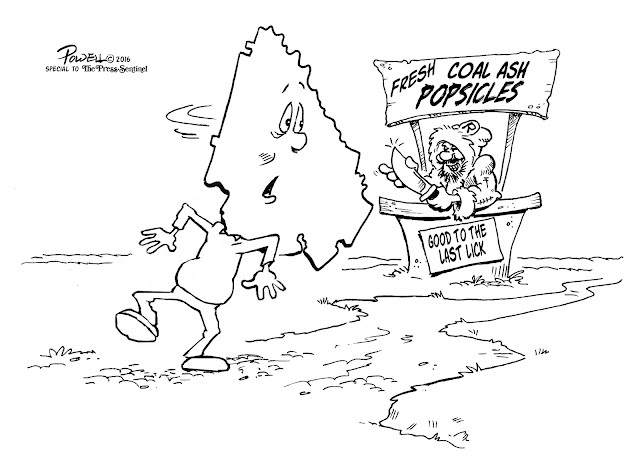 We know the harmful things in toxic coal ash, but who knows what’s hidden in all that garbage? And when Republic Services acquired Addington’s landfill, it used the same tactics in negotiating the current 50-year contract which has dumped all this grief on the unsuspecting residents of Wayne County. What we now have is a situation which allows Republic to be almost “free” to wheel and deal to make our community the garbage bin for the East Coast of America. Add to that a poisonous mountain range of toxic coal ash which we don’t want, either. So, how do these waste-management companies lure us into these traps? The legend of how Eskimos “trap” wolves comes to mind. The process starts with a razor-sharp knife. The Eskimo then dips the blade into animal blood and lets it freeze. Over and over, the dipping and freezing continues until the blade resembles a red Popsicle. Next, the Eskimo sinks the knife’s handle into the ground, leaving the Popsicle exposed. In time, the keen nose of the wolf is drawn to the object. The wolf sniffs and likes what it smells. Without fear, one lick brings another. Before long, the beast is feverishly licking the layers of frozen blood until it reaches the knife’s deadly blade. By then, the wolf cannot recognize the frozen blood from the taste of its own blood. By morning, the unsuspecting, greedy wolf is dead in a pool of its own blood. That’s the way temptation works. Too often, without considering the consequences, we like what we see and taste. And then, just as the dead wolf shows, it is often too late. Yes, the landfill might have looked and tasted good early on. Now, we know the consequences of unchecked greed by county commissioners and/or Republic Services.